We received this product for review purposes. As always all opinions are honest and solely mine and JustaBXgirl’s. Did you know JustaBXgirl was starting school this year? I’m betting unless this is your first time on the blog you most definitely did! As a first time school mommy I am looking for every trick I can add to my parenting magic bag. Let me share with you one I found at Blogger Bash last month, KudoBanz. Are you intrigued? You should be. I’m sure you’ve heard of sticker charts for better behavior. In fact a sticker reward system helped JustaBXgirl when she potty trained herself at three. KudoBanz take the idea behind the sticker chart and make it so much better! Does your little like to accessorize as much as mine? If so then this is definitely the behavior management system for you. We unofficially started our kudobanz at Disneyland. Me: JustaBXgirl, I need you to start cleaning up these toys. Me: Are the toys put away yet? Me: (sigh of frustration) I’m serious these toys need to be put away now. Her: I know mommy. I’m doing it. Me: If I get up to clean those toys up they’re all going in the garbage. Her: Mommy, I told you I’m doing it. Please give me one more chance. Me: (I get up and walk over to where the toys are.) That’s it. You do’t really want these toys. Her: (screaming, maybe some added tears) I’m doing it. Let me do it. And so the cycle would continue for the next six hours. Now? Now the conversation goes something like this. Me: I need you to clean start cleaning these toys up. If you can do it without me asking a second time you will get a kudo. Her: (immediately beginning to clean up) Okay mommy. I know exactly which one I want. This post contains affiliate links. If you use them it does not cost you any extra and helps me cover blog expenses! I know that sounds crazy but it really works. And not just for cleaning up. KudoBanz are the perfect way to start the school year and set expectations. What I’ve been doing since we started using the KudoBanz system last month is to set three goals for the day. You can dish out your kudos anyway that works for you. Three goals a day works for us. Each day the goals might change a bit (the cleaning up one has remained constant). Once she meets her goal JustaBXgirl chooses which kudo she wants to add to her band. She knows the third one will be special because it means she gets a reward. One of my favorite parts of the system is that we set the rewards ourselves. JustaBXgirl gets new toys pretty regularly between the packages that arrive in our home and those that she buys herself with the money she gets from her Abuela to the toys I can’t resist when I find add-on prices on Amazon. Either way, when setting up her rewards I knew I didn’t want to include anything that would cost money or add to the massive amount of STUFF in our very small apartment. Instead, JustaBXgirl earns rewards like being able to stay up late, get an extra story or have dessert before dinner. You know your child and you know what rewards work for them. And since they spin the wheel to get their reward it’s an added fun part to the “game.” They also get to climb levels on the app. Oh, did I mention that there was an app? Yup, you know there’s an app for everything. She ended up giving her cousin the blue. Think I might treat her to the assorted color pack as an added treat! To get our home ready for back to school I’ve been shifting JustaBXgirl’s bedtime. At the beginning of the year she didn’t even have one. we now have it up to 9p. My goal is to get it to 8p by school. Next week it shifts to 8:30p. When the shift happens I use the third judo to get her to lay down and go to bed without fussing. These things work magic! 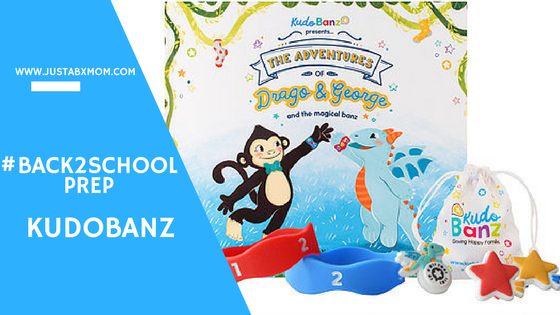 The starter kit comes with two bands, 6 kudos and a storybook that tells the story of Drago & George and their KudoBanz. It is the perfect way to introduce the concept of the KudoBanz system to your little. And who doesn’t love story time. With the two bands and six kudos you can start the system for two littles. JustaBXgirl decided that one of her cousins needed it to better his manners. She picked out which three kudos he could have and gave him one of her bands. JustaBXgirl likes having options. She would get bored if she only had the same three kudos everyday so we have two collections on top of what came in the starter pack. We have the princess collection and the superhero collection. JustaBXgirl likes to mix her kudos. They’re definitely a conversation starter. I think we will be getting the safari and the panda collections next. Remember, she has to wear a uniform this year so we are looking for all of the other ways her personality can shine through. This will definitely help. This day she earned a kudo for helping me dog sit! Three things I want to share about KudoBanz that show you I am all about bringing you the truth in my reviews. One of our original bands somehow broke within a few days of use! I have no idea how it happened and when I contacted customer service they were very apologetic and sent me a replacement immediately. They also shared that they hadn’t heard of other bands breaking and I believed them because there is no seam or any place that looks like it would break. I truly believe that it was a fluke but I’m kind of happy it happened so I am able to share how great their customer service is as well! The second thing I want to point out is that these bands are designed for children 3+. They do contain small parts so please make sure your little does not put things in her or his mouth as they can pose a choking risk. And finally because they are designed for children 3+ they are small. JustaBXgirl fits hers and will fit it for a while. Her cousin, the one she gave her second band to, is 7. It was tight for him to put it on and he is a small 7. If your little is over 5 or 6 I would contact the company before purchasing to get the specific size of the band to ensure that it fits. Make sure to enter your number below to get 8 texts a month from me. I’ll be sending out some great deals, giveaways and fun finds just for those signed up. This is super cool, when my lil little starts school def gonna do this. We have melt downs for clean up time as well so def can relate. It’s even good to start with littles that aren’t in school because then by the time they get to school they’re already used to it.